I know there are many Amazon sellers in this situation, staring at the shoebox full of receipts, anxiety building as you get closer and closer to year-end and tax deadlines. You may not even have any idea of whether or not you are making a profit, which also adds to the stress. If this sounds familiar, you are not alone. The good news about your situation is next year will be different because you are going to implement a trustworthy accounting system (right?) to avoid this stress in the future. This is fixable, panic no more! I have some tips to help get you on the right track. The bad news is you can't go back in time and do this year differently, but it won't be as horrible as you think to get things fixed. Just start where you are and work on it little at a time. If you start now you'll be ready in plenty of time to get your accounting records to your CPA to meet the April 15th tax filing deadline. Here is what I suggest. This is a pretty simplified version but it will get you most of the way there. a. Download a .pdf from the bank and save electronically. Do not save locally on your computer. Be sure to save elsewhere. We really love Dropbox which is a free cloud-based storage solution. The nice thing about Dropbox is you can access it from any computer and you can also share access to your files with others. This could be your Amazon business partner, your CPA, or key employees. b. Some prefer “old school” which is to save a copy in a paper file. There is nothing wrong with this; you just need to do what works best for you, but be sure you do something! 2. If you just started your e-commerce business this year, determine whether or not you want to use an accounting software for this year or limp along until January 1 of the upcoming year. Some people in your position may choose to start on January 1 of the upcoming year rather than spend time catching up for this year, especially those who are really busy sourcing inventory and managing their business on other tasks. 4. Review the Schedule C to get familiar with it, spend about 10 minutes reading through it. Think of the Schedule C as the framework for what you are trying to accomplish. b. Expenses - if you do not report any expenses, you will pay tax on 100% of the income. To support expenses, use bank and credit card statements. The receipts provide the detail of the transactions - do not try to create a listing of expenses from receipts, it's too hard. Use the statements instead. c. Go through each transaction and identify what category in the Schedule C each one should be in. Some people do it "old school" and use colored highlighters and pen/paper. Others create a simple excel spreadsheet. If you start now and just do a few transactions a day, next thing you know, you'll be caught up! Then, on January 1st of the upcoming year, you can start with accounting software. However, if you want to start now with accounting software, I have found QuickBooks Online is the easiest for most sellers to use after having helped hundreds of sellers learn how to do their own bookkeeping. A final tip is to be sure and share with your CPA what you did to recreate the current year income and expenses; there may be some fine tuning he/she suggests. I know it is frustrating and stressful to have to deal with the mountains of paperwork. However, once you get it caught up, it will not be that bad to maintain monthly. Plan to spend about four – six hours per month working on your books. If you spend more time than that, you may want to review your processes to ensure you are working as efficiently as possible. 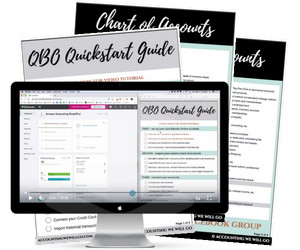 If you haven’t begun to manage your accounting, or if you’ve fallen behind and don’t know how to get organized, enter your information below to download our FREE QBO Quickstart Guide to get you started using QuickBooks Online, including a video tutorial and Chart of Accounts specific to your Amazon FBA business.